Okay, here's the deal. If you want amazing potatoes, you've got to do a little more than just throwing them in the oven. Don't get me wrong, while in a time crunch, the latter will do just fine and taste great. But if you want perfect crispy buttery amazing goodness, you've just got to take it a little further. 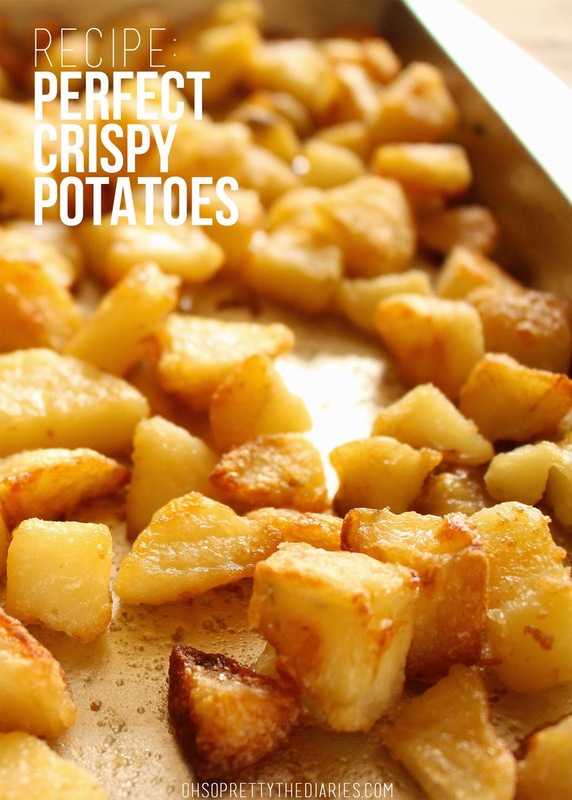 Now this recipe has very few ingredients because we want the potatoes to taste like potatoes. After you master this recipe, it's fun add different herbs and seasoning. But this is the basic recipe and these potatoes will go with ANYTHING. ANY time of day. 2. Put your potatoes in a pot and cover with water. Add a little salt. 3. Bring pot to a boil then reduce heat to medium for about 15 minutes. 5. Put the potatoes back in the pot and swish/toss them around a bit. This will make the edges more rounded and soft. This is necessary for extra crispy-ness. 6. Mix the oil and butter and toss into the potatoes. 7. Lay the potatoes out on a baking dish in one layer. 8. Sprinkle salt on top and bake in the oven for 50 minutes. Turn the potatoes a couple times in between. These look amazing! I can just feel the crispiness from these pictures! Looks delicious!! I love crispy potatoes!